A material’s properties are strongly linked to its microstructure, such as grain size, porosity, phase and non-metallic inclusions. 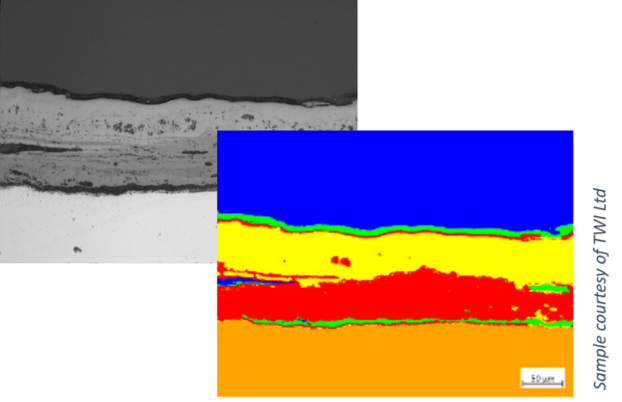 Light microscopy is a powerful tool for evaluating a material’s microstructure, but extracting meaningful results using traditional image analysis can be challenging, especially for new materials or materials with multiple phases. For instance, magnetic materials being developed for use in electric motors consist of complex structures. Segmentation of these structures in different phases can prove difficult with traditional image analysis techniques. High Temperature Corrosion Scale on 9% Chromium Steel.